It’s hard to think of a place that we could have started our time in Europe that wallops your budget harder than London does. 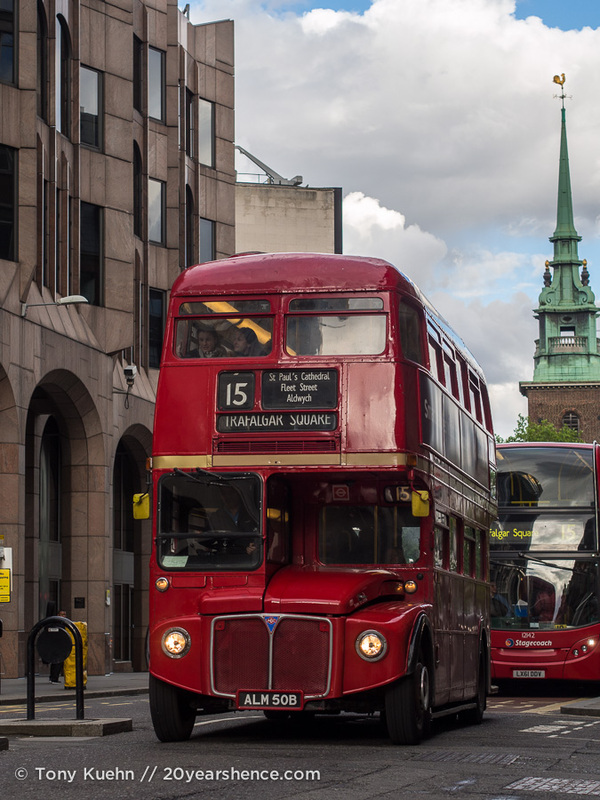 Regardless of where in the world you’re coming from, London is expensive, plain and simple. 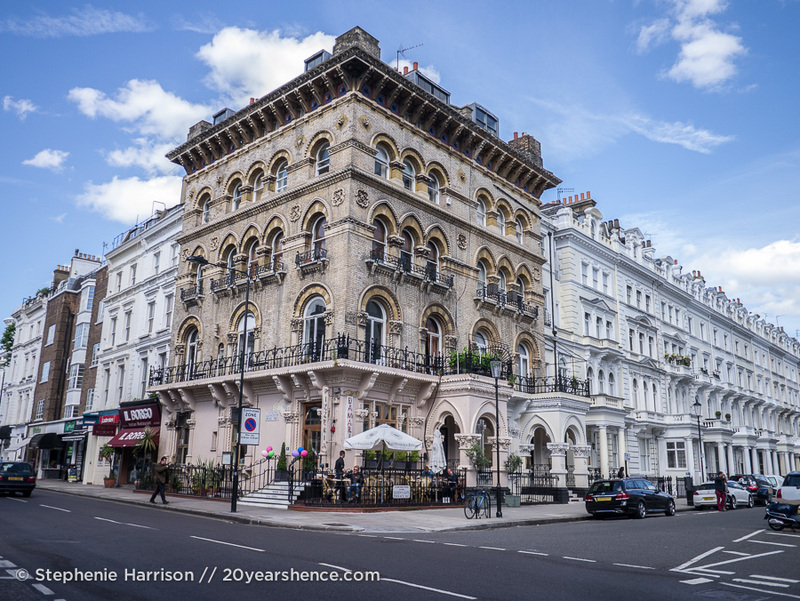 From the cost of a “cozy hotel room” (read: cramped) in a “local neighborhood with character” (read: dodgy), a ride on the Tube, a cuppa or a pint down at the pub, for all the things that London does well, it will also drain your budget alarmingly fast. And if your home currency isn’t the pound, then watch the prices inflate even more dramatically and your travel fund dwindle all the quicker. 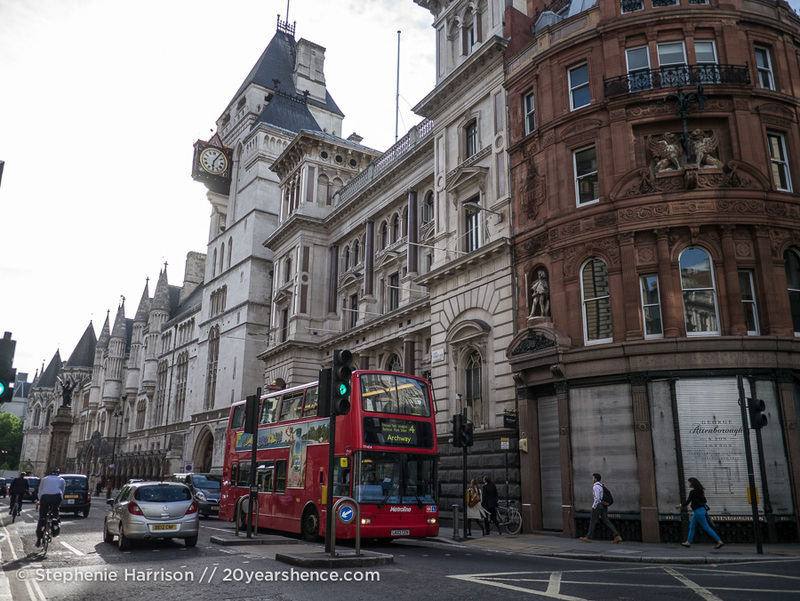 By the time you’ve paid for unavoidable necessities, like lodging, transport and food, you may feel as though you don’t even have two pence left to rub together, never mind actually enjoy the city with. Although we were lucky enough to have friends with a spare bedroom while visiting London, coming from Asia we still had our fair share of sticker shock to deal with. Which is why we decided that during our time in London, we would do our best to enjoy the city without paying a single pence or pound on attractions or entertainment. 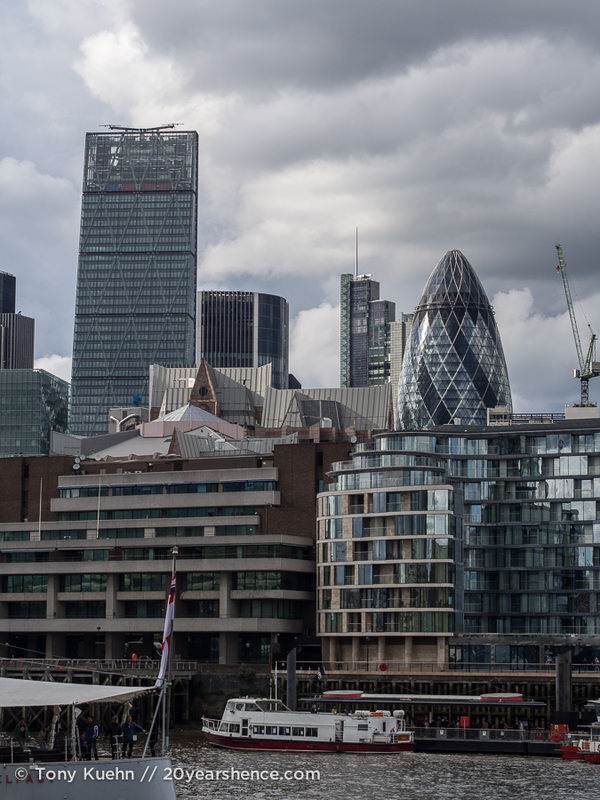 Given that London is currently the most expensive city in the world, you might expect that our miserly stance would result in us doing a whole lot of nothing and missing out on much of what the city has to offer. 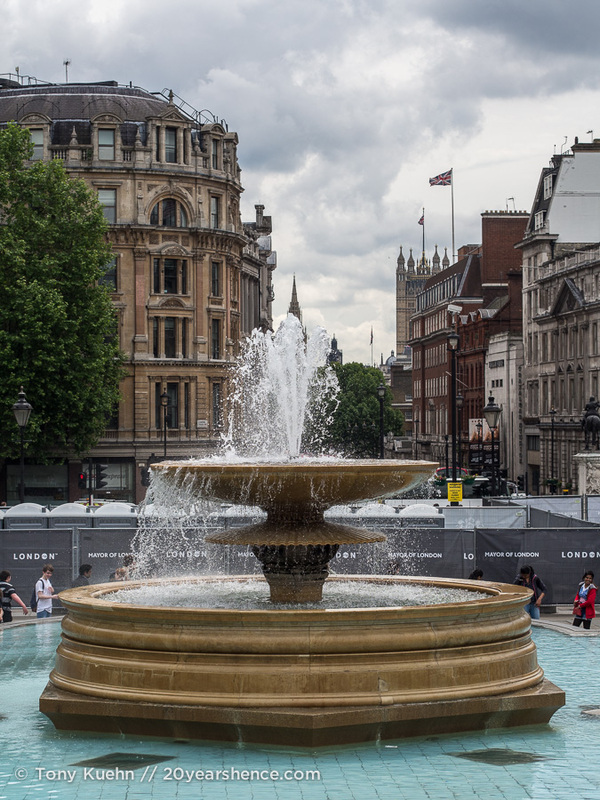 In actual fact, we were overwhelmed by the number of free things to do in London. 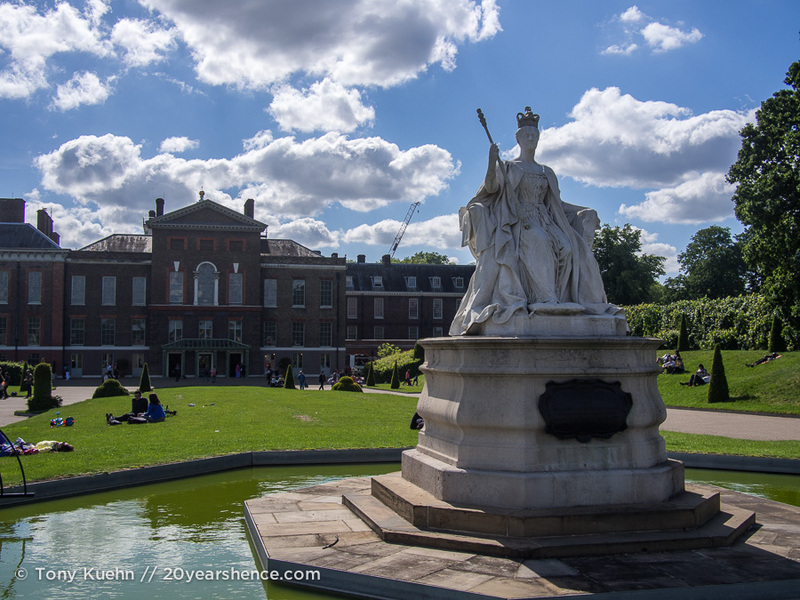 Read on for activities and attractions that enriched our time in London without making us a penny poorer at the end of our visit, as well as tips & tricks for how to make your budget stretch when spending some money can’t be avoided. 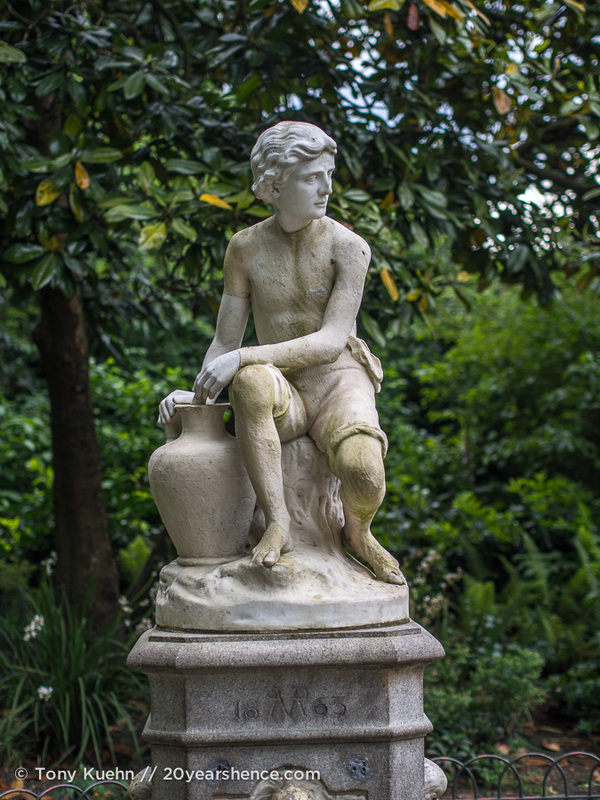 Home to an extensive art collection (both British and international) dating from the 1200s to the 1900s. The building dates back to the early 1800s and is worth a visit on this basis alone. 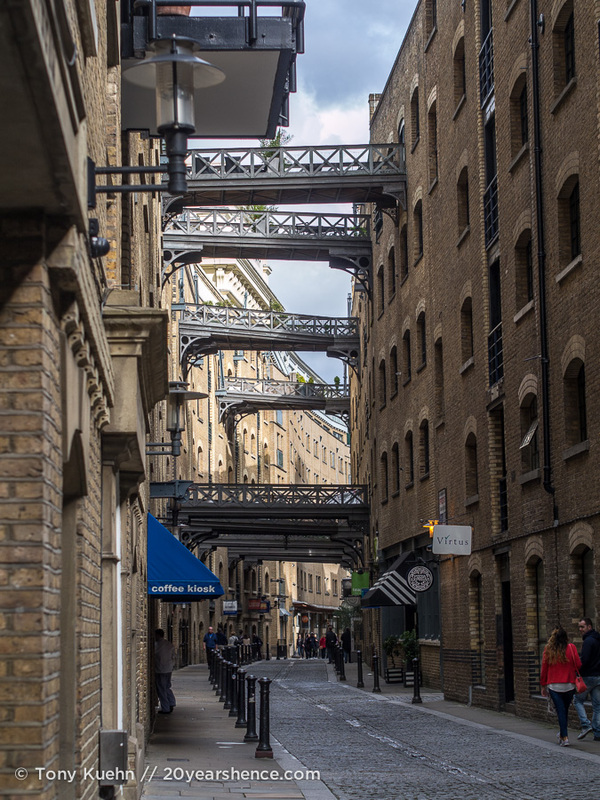 Based in the erstwhile Bankside Power station (sister to the more famous Battersea Power Station), this museum houses London’s premier modern art (1900 onward) collection. 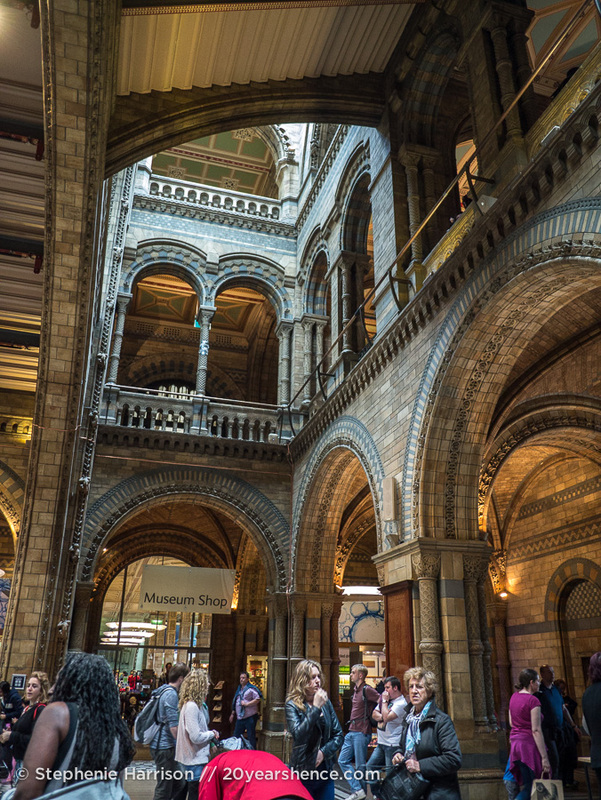 Stuffed to the gills with animals, minerals, dinosaur bones, and other artifacts that trace the evolution of our planet, the Natural History Museum’s entrance hall is a stately tribute to England’s grand past and worthy of a short visit in its own right. 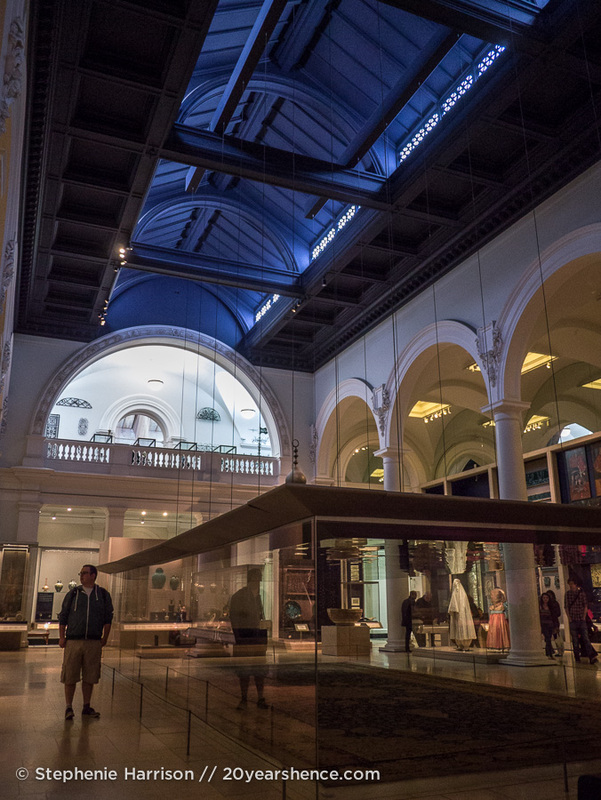 Full of bric-a-brac & trinkets, the V&A is London’s preeminent art & design museum. 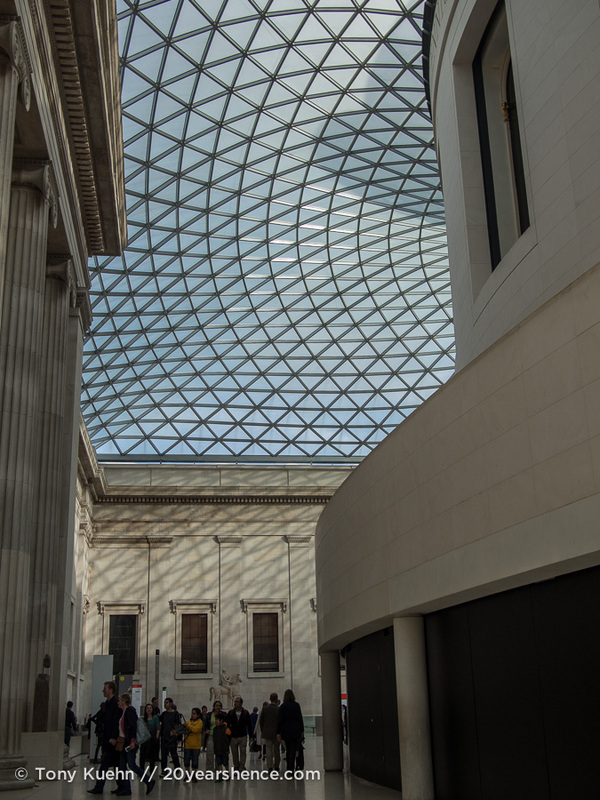 Dedicated to preserving and celebrating the history of human civilization and culture, half the fun at the British Museum is identifying all of the items that rightly belong in some other country! The central lobby is also wonderfully photogenic. In the case of the Tate Modern & Natural History Museum, we simply popped in to take a few pictures before continuing on our way, but most of these museums are massive and have sufficiently large collections that you could easily spend a rainy day (of which London gifted us with many!) in any of them. 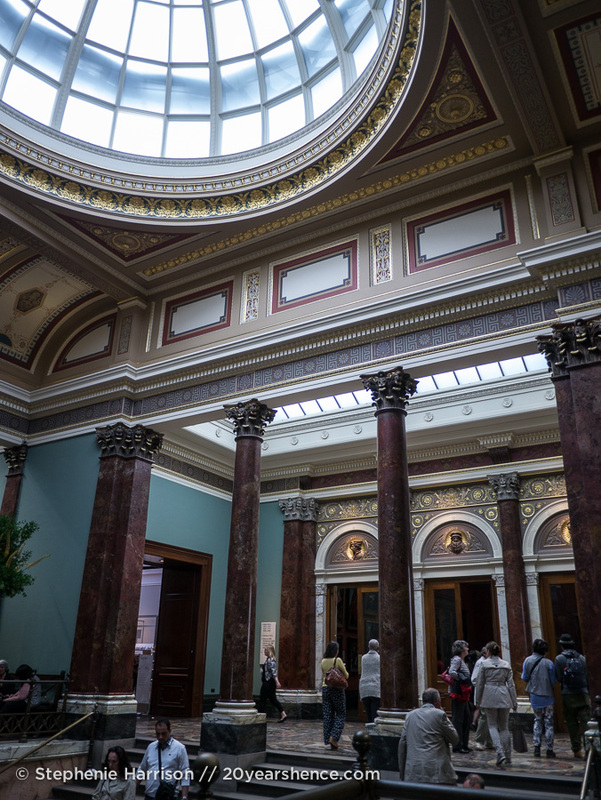 What I especially love about free museums, however, is that you can spend as little or as much time as you feel is enjoyable and you never need worry that you got your money’s worth. It’s worth noting that many of the museums have special exhibits that require paid entry, but they all have large permanent collections that are completely free. For a complete rundown of London’s free museums, we used this guide to compile our “must see” list. There are FAR more museums than what we managed to fit in. 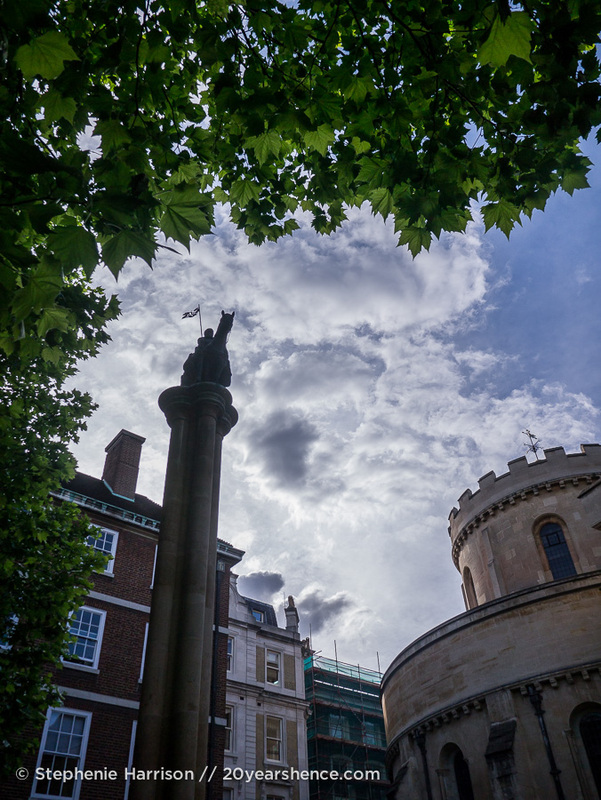 A few that we didn’t manage to fit in but that we believe would be worth a visit (and will certainly be at the top of our list on our next visit) are: Sir John Soane’s Museum, The Wallace Collection, and the Museum of London. 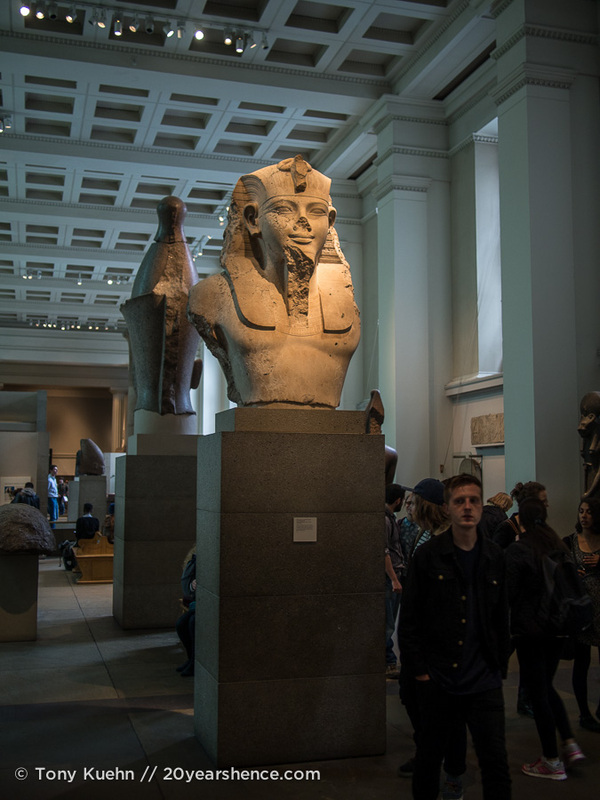 If at all possible, plan to visit free museums during the week; as you might imagine, the queues and crowds are substantially larger on holidays and weekends. 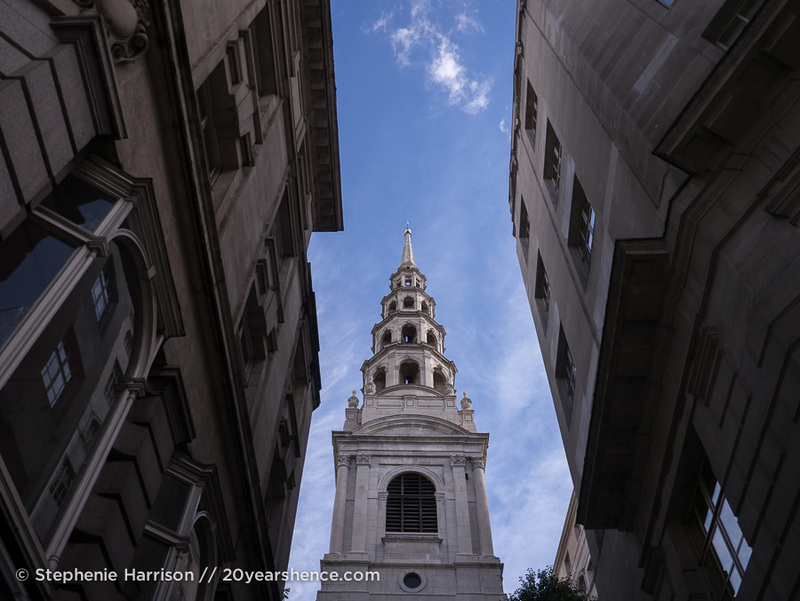 After experiencing temple burnout on more than one occasion in Asia, the churches of Europe were a refreshing palate cleanser and London certainly gave us plenty to choose from. 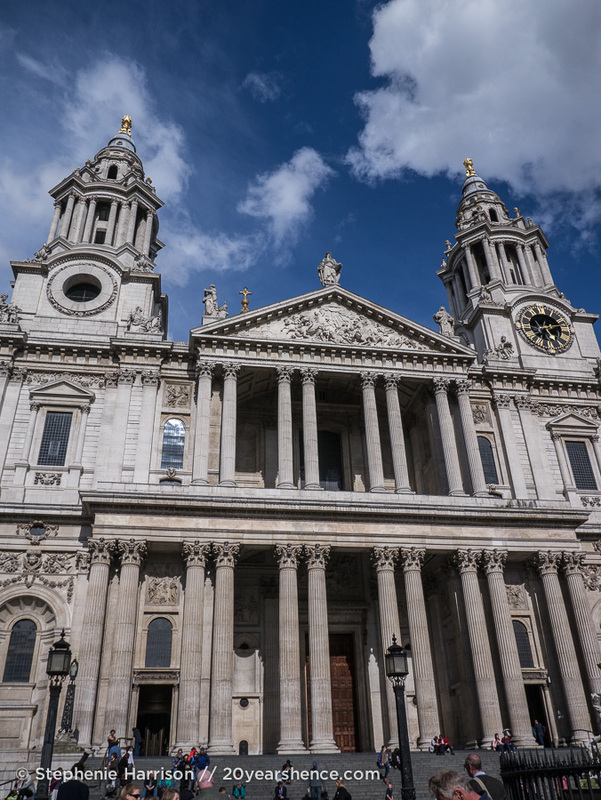 Although the city’s two most famous churches—Westminster Abbey and St. Paul’s Cathedral—actually charge an admission fee, we found we were perfectly satisfied to simply gaze on these structures from the outside. 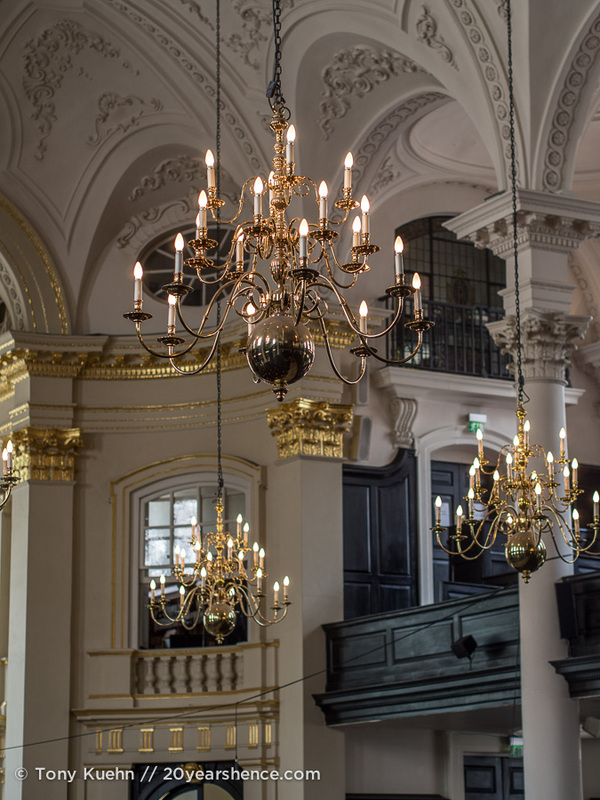 All of London’s churches are still active houses of worship, so if you are dead set on seeing the interior of Westminster or St. Paul’s but don’t want to pay the admission fee, you can always attend a service. 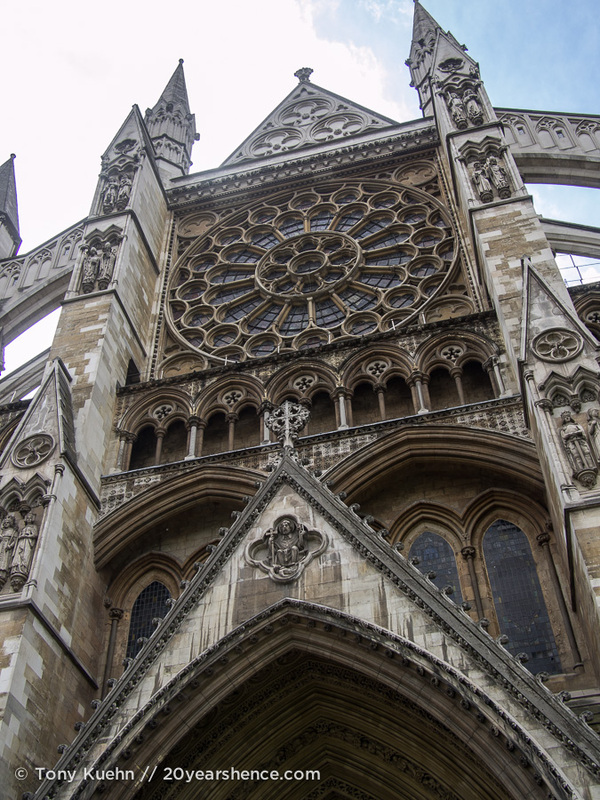 We had intended to visit Westminster Abbey for evensong one evening, but didn’t manage to squeeze it in. 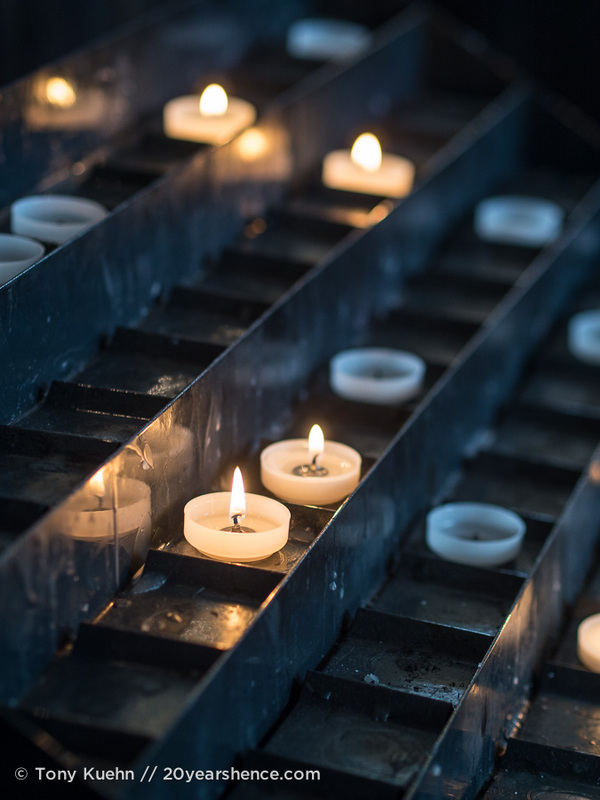 Remember that only part of the church may be open to you during services and—whether you are a believer or not—you should behave respectfully at all times, but especially during a service! Right off of Trafalgar Square, so you really have no excuse to miss it! 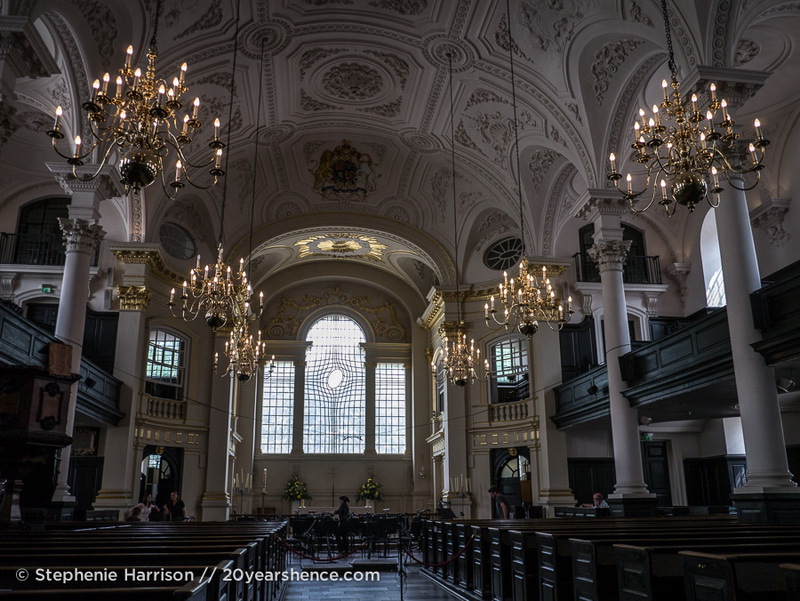 Another Christopher Wren masterpiece, this one is believed to have inspired the now standard “tiered” wedding cake shape. 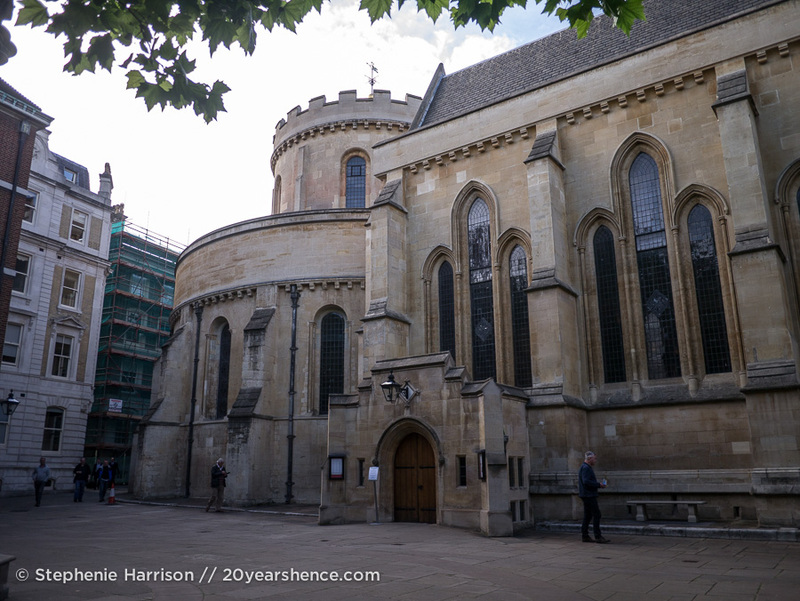 One of the oldest buildings in London, parts of Temple Church date all the way back to the 12th century. 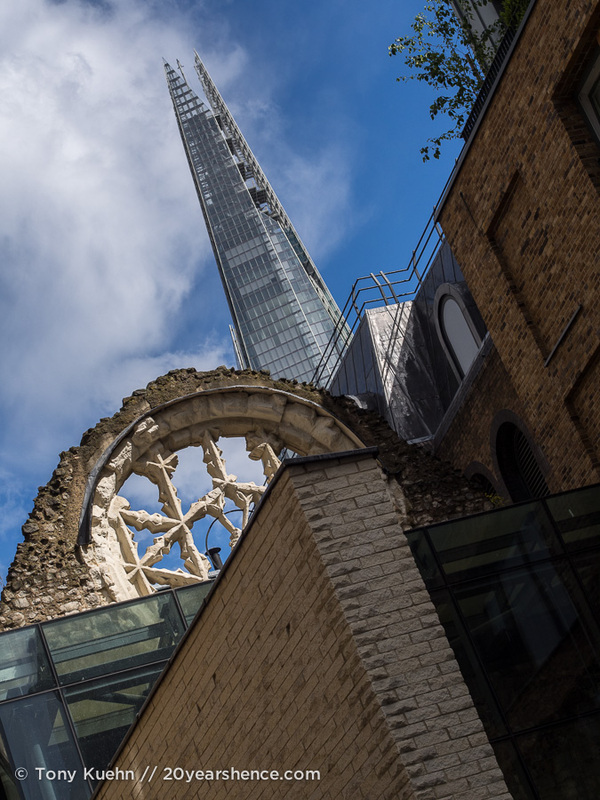 Consequently, it looks quite different from many of the city’s other churches and is the perfect place to let your imagination run wild with regards to Templar conspiracies! 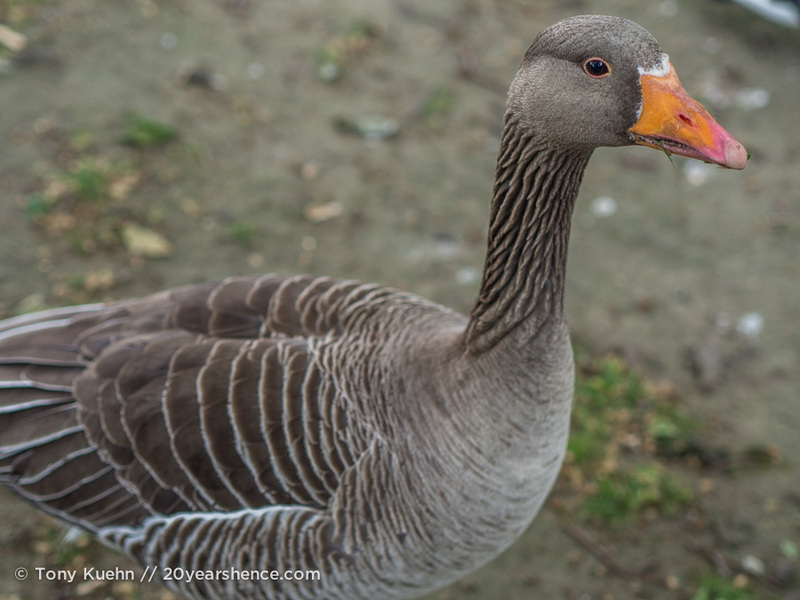 We spent a substantial amount of time in St James’s Park, Kensington Gardens, Green Park (before a sudden thunderstorm sent us scrambling! ), and a random park south of Brixton that we visited with friends but whose name now escapes me… but there are plenty of other parks and quiet green squares to escape the bustle of the city and relax within. 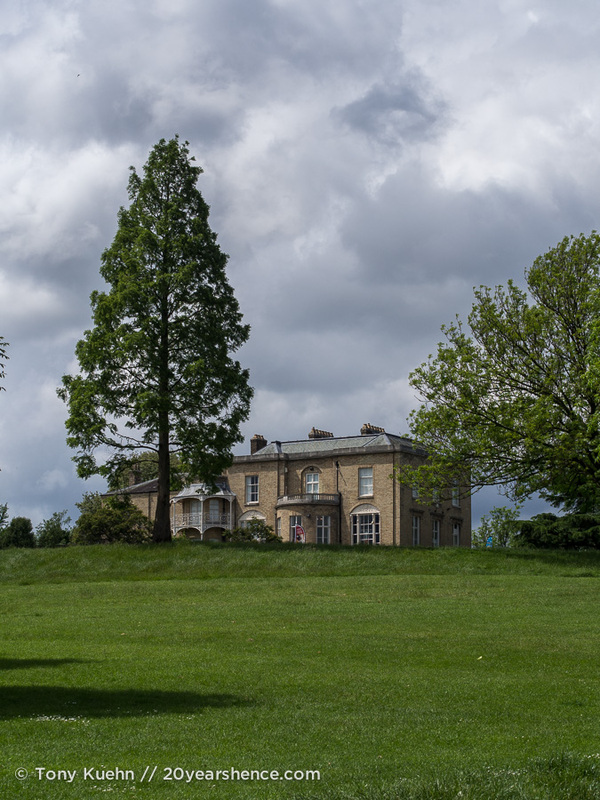 Next time we’re back, I want to check out Richmond Park and Hampstead Heath, which are supposed to be fantastic for photographers. London is a huge, sprawling city, and so although it is impractical to try to tackle the entire city on foot and strategic use of the Tube will serve you (and your feet) well, it is also a fascinating city with so many pockets that one of the best things you can do that will cost you absolutely nothing is to pick an area and just go for a walk. 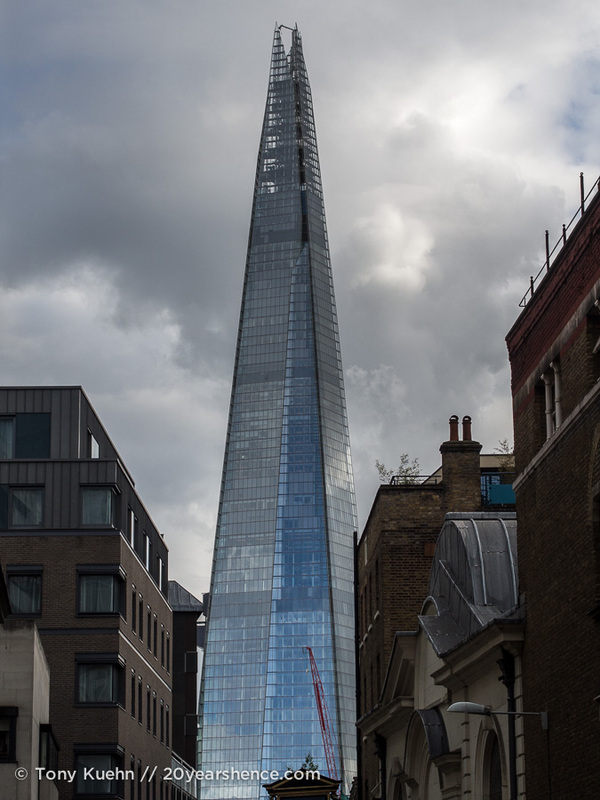 You’re guaranteed to see some interesting buildings—haters are gonna hate, but I think London architecture is fab—and will undoubtedly stumble upon some wonderful pieces of history. 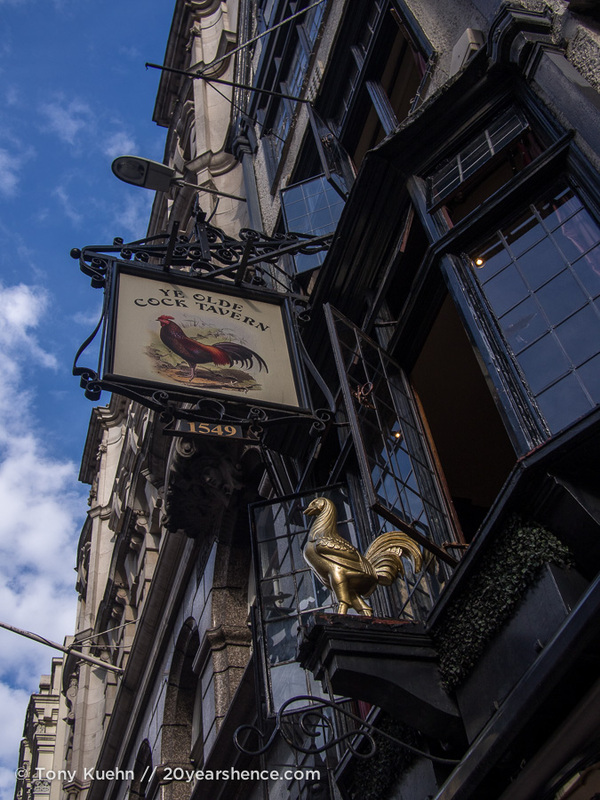 One of our favorite stretches to explore on this visit was Fleet Street—an area that dates back to the Middle Ages, and used to be known as the city’s newspaper hub as well as the Inns of Court. It’s largely filled with accounting firms and law offices these days, but it’s still intensely atmospheric and has plenty of great architecture to gawp at. 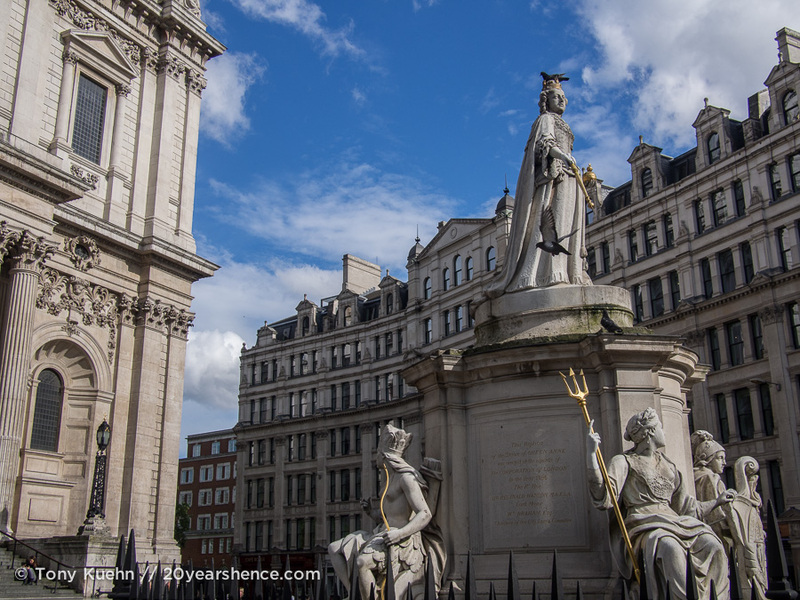 Additionally, plenty of London’s most famous sites are public places that you can freely wander about at any time of day. Stand in the center of Picadilly Circus and watch the black cabs and bright red double-decker buses swirl about you. 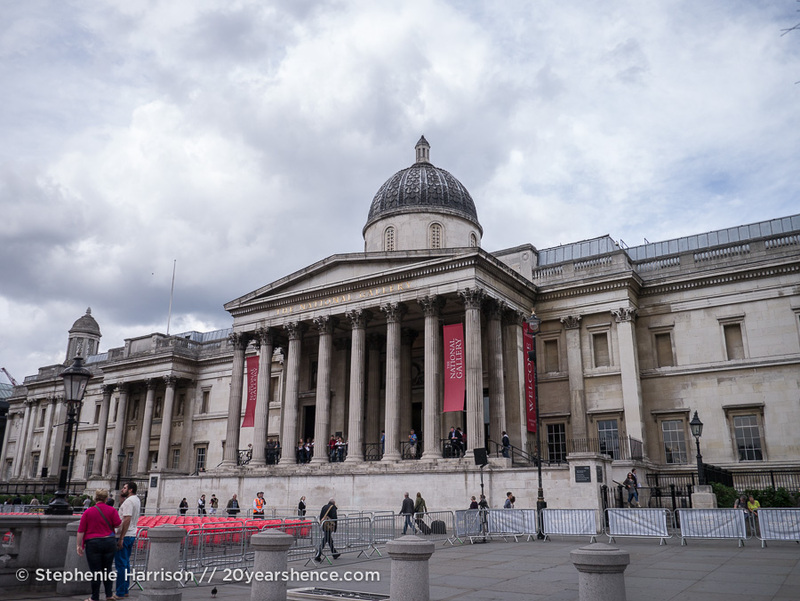 Wander through Trafalgar Square, darting into the many free museums that circumscribe it. 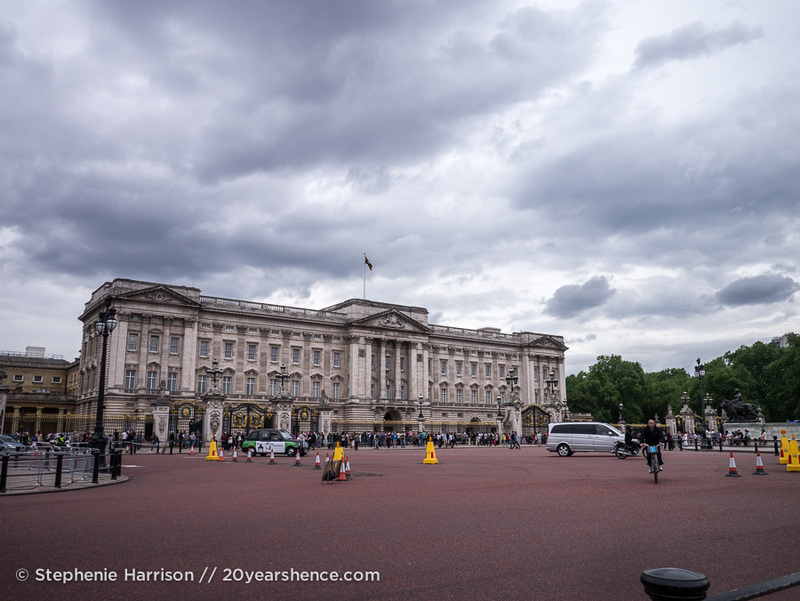 Stroll down the Mall towards Buckingham Palace where, if you time it right (and get there early! ), you can watch the changing of the guards for free (albeit from pretty far away… To be honest, the horse guards parade, sounds way cooler.) 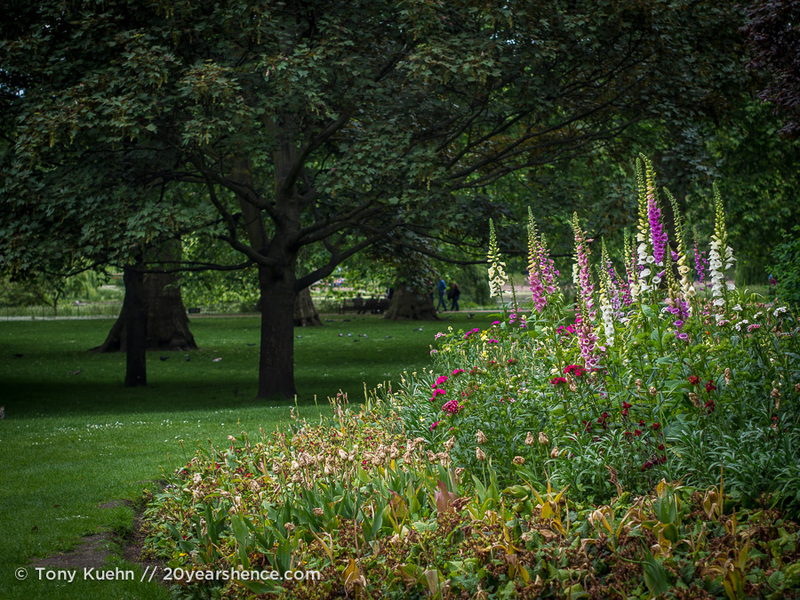 Then skirt along St James’s Park as you traipse down Birdcage Walk, which will spit you out at the Thames right at the foot of the Houses of Parliament and the clock tower that is home to Big Ben. Hearing him chime the hour will leave no doubt that you are in London and costs absolutely nothing. 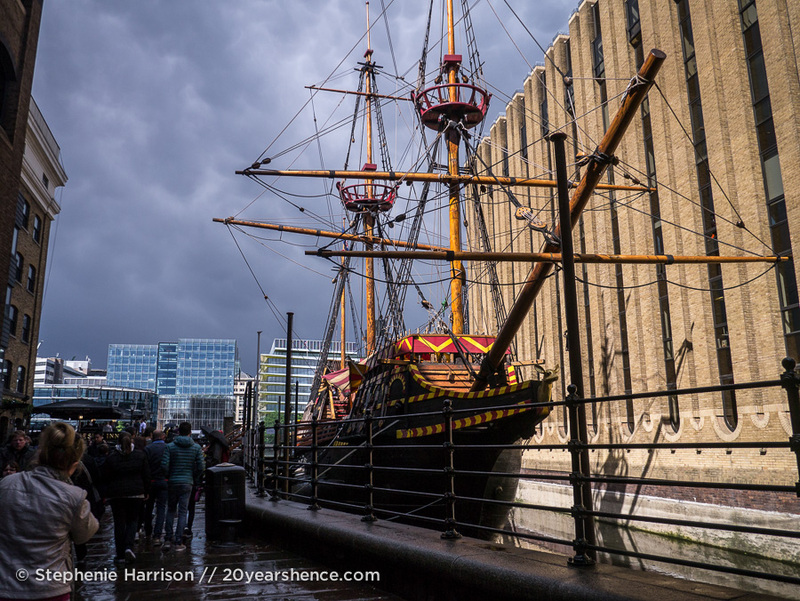 Who out there says there’s nothing to do in London? 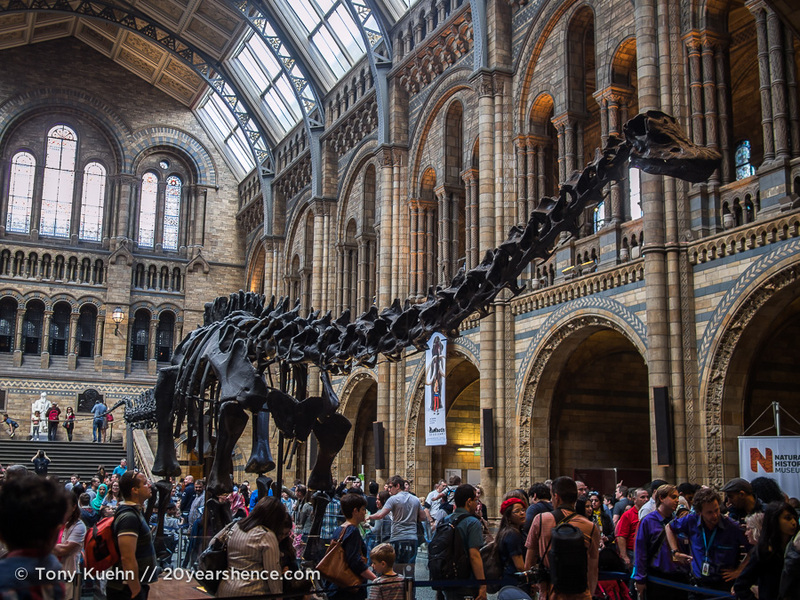 Although there are so many free attractions to fill your time in London, it’s true that there are plenty of big ticket attractions that come with the big prices you would expect. Things like riding the London Eye, touring Buckingham Palace, visiting the Tower of London and Westminster Abbey will cost you… a lot. 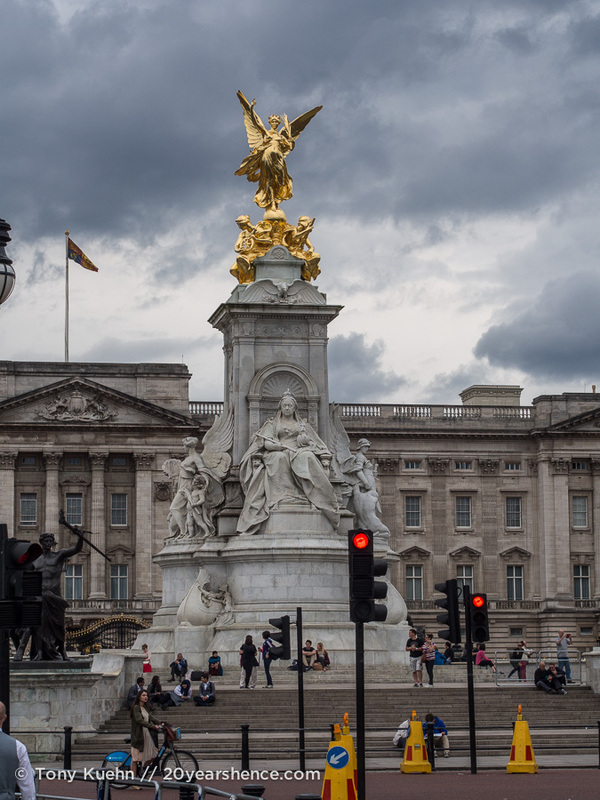 If you’ve always dreamed of visiting these places and feel your trip to London will be incomplete if you don’t get to see them, then you certainly should. However we personally felt that those weren’t critical to our enjoyment of the city and were more than content to simply view the exteriors of famous buildings rather than paying to visit them. 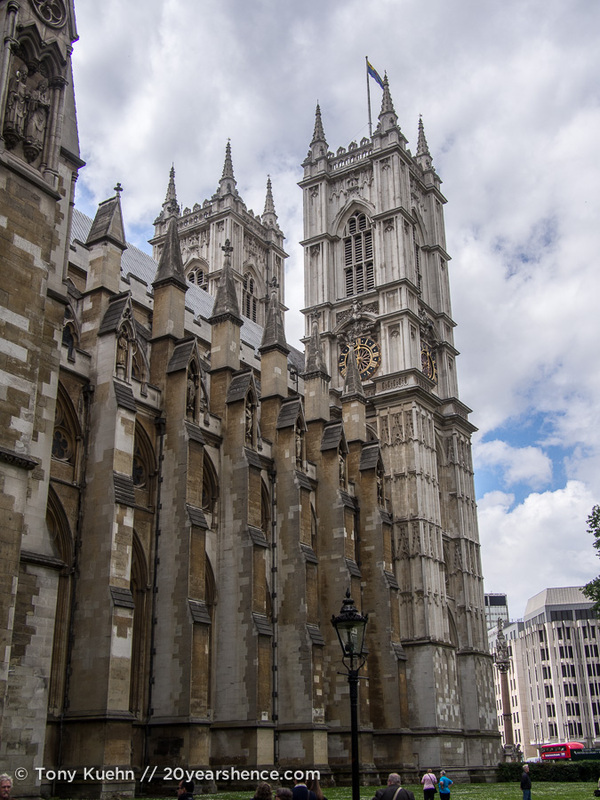 There was so much to see and do for free that we personally couldn’t justify paying £18 (~$30US) per person to visit Westminster Abbey, £22(~$35US) per person to see the crown jewels in the Tower of London, or £26.55 (~$43US… advanced online ticket price!) 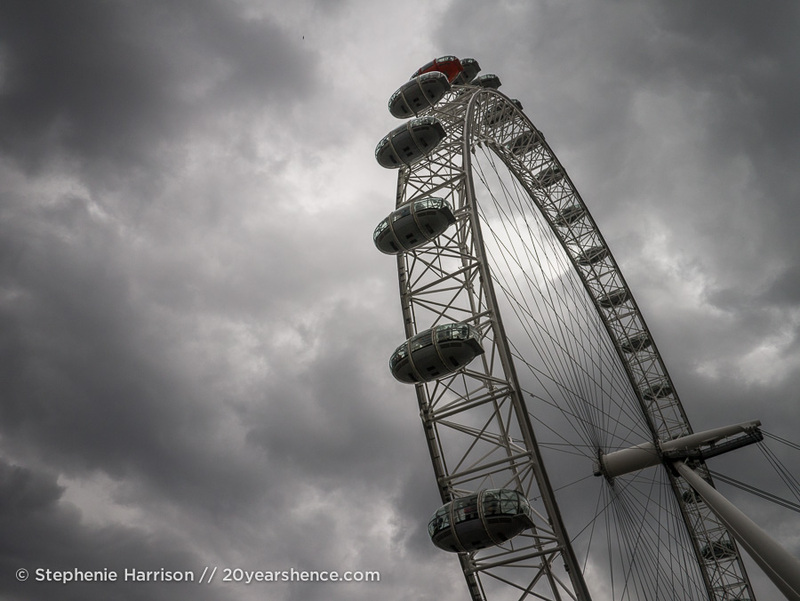 per person to ride the London Eye. 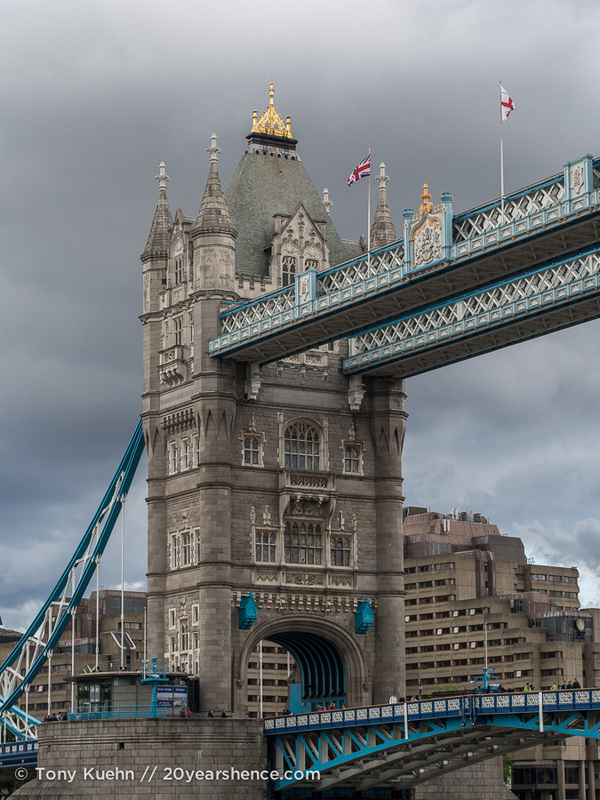 (And, of course, there are far more attractions in London that charge an admission fee—not all as steep as these, but still quite pricey nonetheless.) We got pictures we were happy with of all these things without paying a cent and that was good enough for us. If you are dead set on visiting these places and tend to favor relatively packed touring schedule, there are passes you can purchase that give you free entry to a bunch of attractions that might be worth the money. Alternatively, to encourage domestic tourism, some attractions offer “2-4-1” entry upon presentation of a rail ticket. There are a bunch of hacks out there where people have calculated the cheapest ticket into London that should allow you to take advantage of this deal, and if you get a London travelcard that is issued from the rail station (read: NOT Underground stations and NOT Oyster cards) this is also eligible. 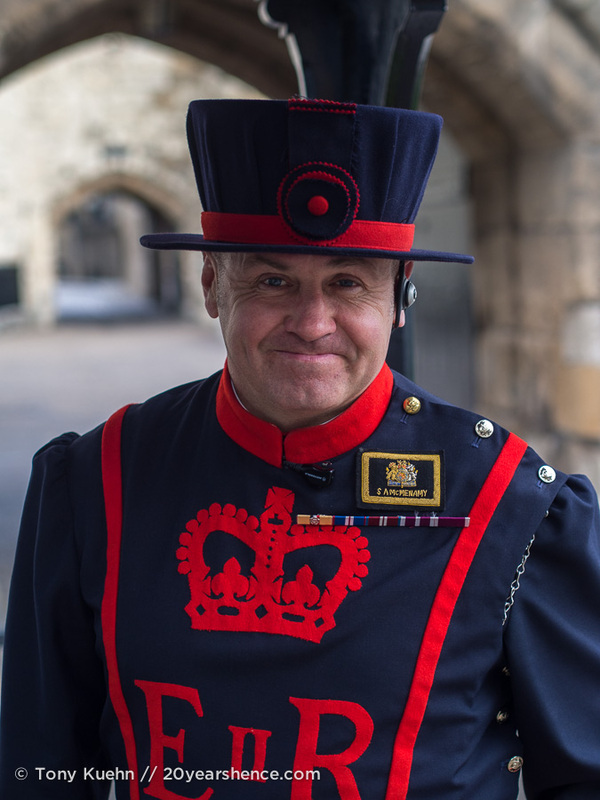 We considered doing this to visit the Tower of London but—like so many things—we ran out of time. If you are interested in going this route, read the details outlined here. It can get complicated and there are many ways to screw it up, so read carefully! 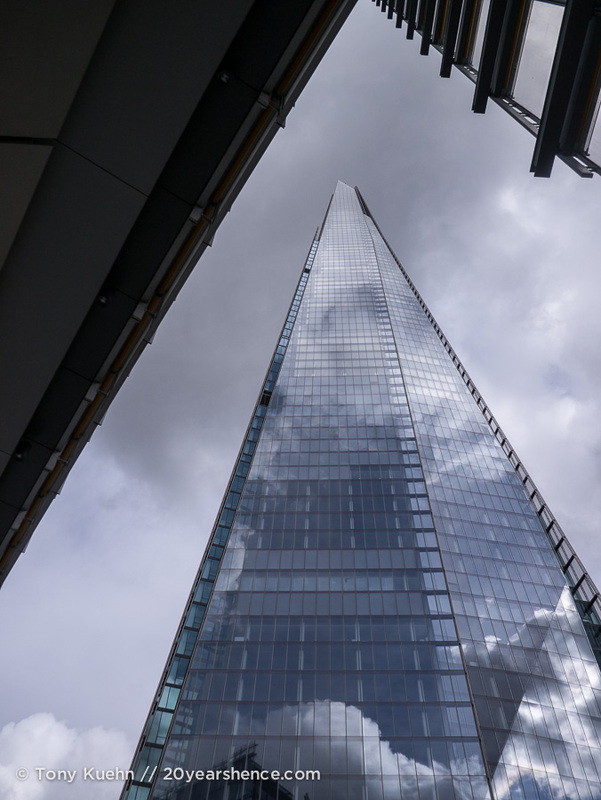 Even being absolute misers and staunchly refusing to crack open our wallets for any of the city’s attractions, our days in London were always packed with sightseeing and activities and we never felt we were missing out. 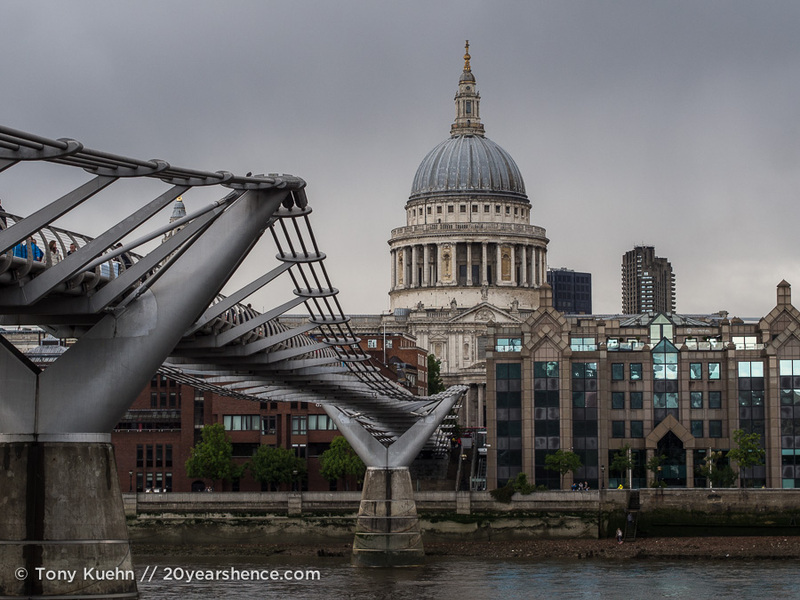 It’s easy to feel extremely poor and go very broke in London, but I still maintain that if you’re going to visit an expensive city on a budget, there are few places that deliver as much London does for free. Now it’s your turn! 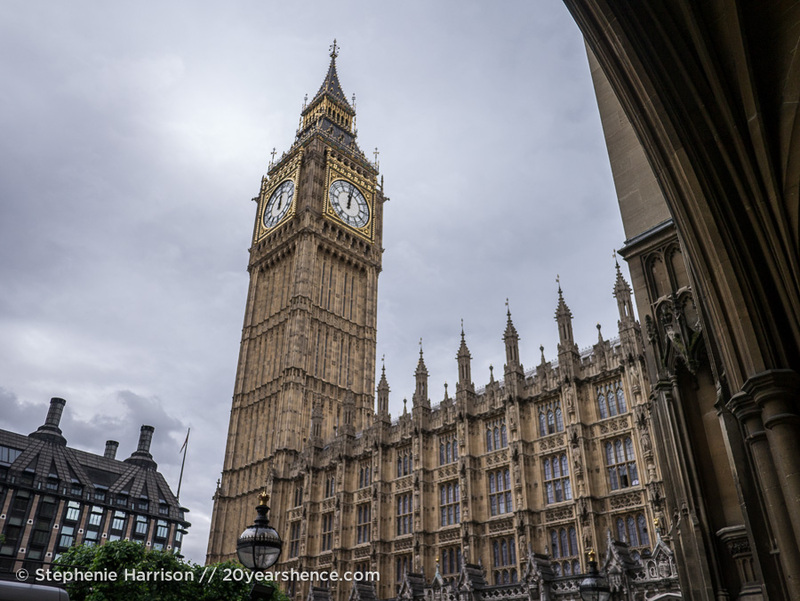 Tell us: What’s your favorite free thing to see or do in London? If you were on a strict budget while visiting the world’s most expensive city, which of these things would you most like to see for yourself? Chewing the Fat with A Cruising Couple! 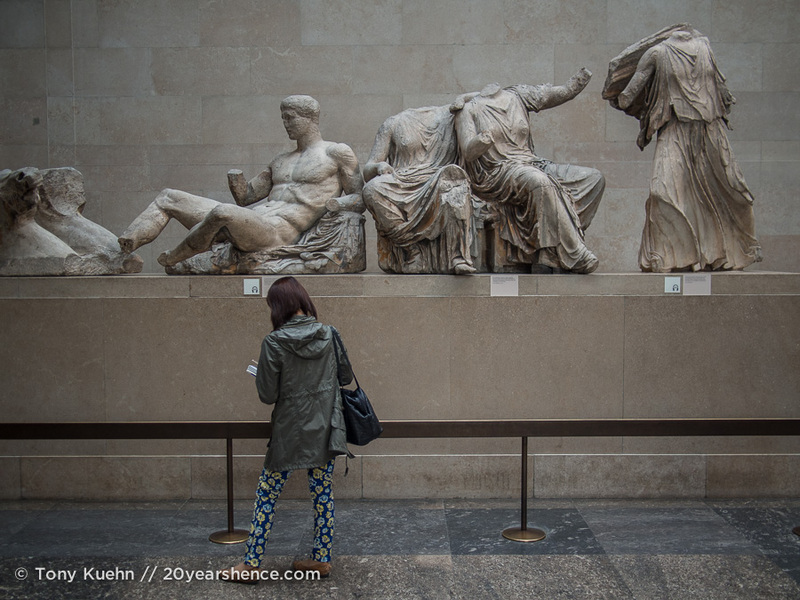 Our time in Europe was skewed a bit more towards free attractions than it might have otherwise done had I not already been to several of the places we visited. As I’d been to London several times, I’d done many of the standard paid attractions, so I really left it up to Tony to decide which—if any—of those he wanted to go to. 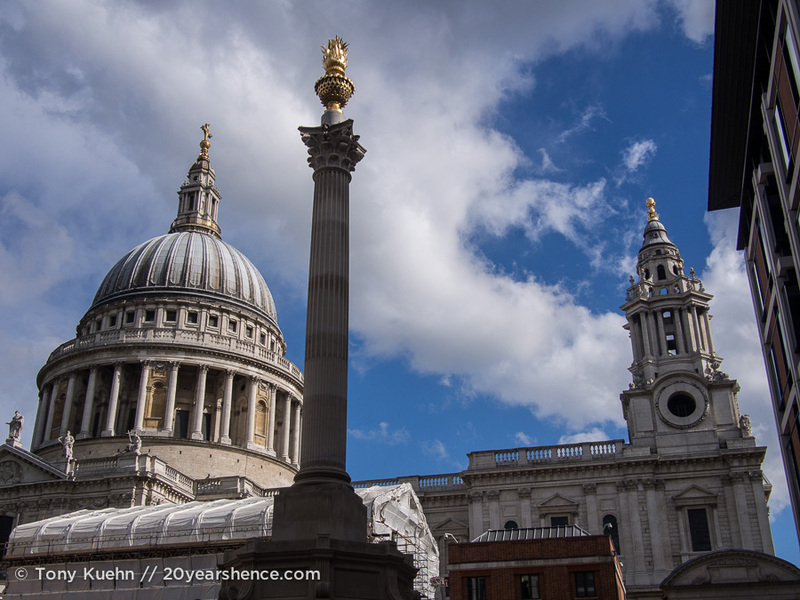 I agree that the Tower of London is a great (albeit pricey) attraction, and I did enjoy my visit to St Paul’s too. I’ve seen several shows while in town as well, but nothing was calling out to us this time (and Toronto has its fair share of big shows as well). Good call on Groupon—we have definitely gotten out of the habit of checking sites like that, but you’re right that great deals can be had. I remember loving the free museums in London! 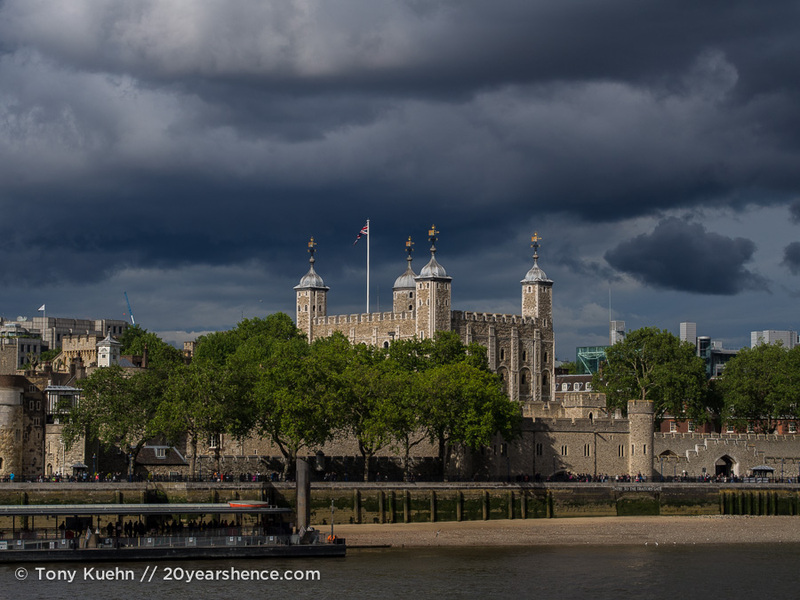 When we were there we really did things as cheaply as possible, and so the only thing we shelled out for was the Tower of London because I was so intrigued with it’s murky past. I think London is a perfect city to just wander. All your posts are making me want to get back to England a lot sooner than I would’ve guessed! I’m so glad our posts are making you see England in a new light! We definitely did not find that all European cities were equally good at catering to poor budget travelers so, in retrospect, I appreciate all that London offers for free all the more. Because I’m not a huge museum buff, I definitely prefer when they are free as I find I am more likely to enjoy them and spend time in them than I otherwise would. London is a great city to walk, although it is way too big to tackle entirely on foot. Still, we would often take the Tube somewhere and then just wander around for hours. The Tube is definitely convenient, but you miss out on a lot if you’re constantly traveling underground. I have no doubt that having you as our guide was part of what helped us tumble so madly in love with London! Was so wonderful to get to see it with a local by our side; whenever we think back on our happy days together, it always brings such big smiles to our faces. Miss you tons and we hope that life is lovely out in the English countryside! On thing I love about London is that so many great museums are free to enter. 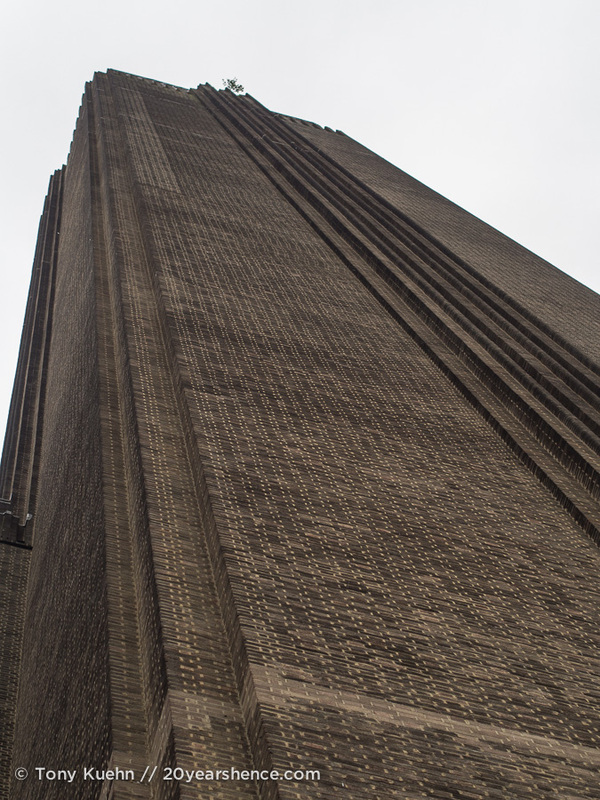 I have been in many of the one you mentioned more than once and I think my favourite ever is the Tate Modern. In fact every time I’m in London, no matter how long I’m there for, I must visit the Tate Modern, it’s simply awesome! 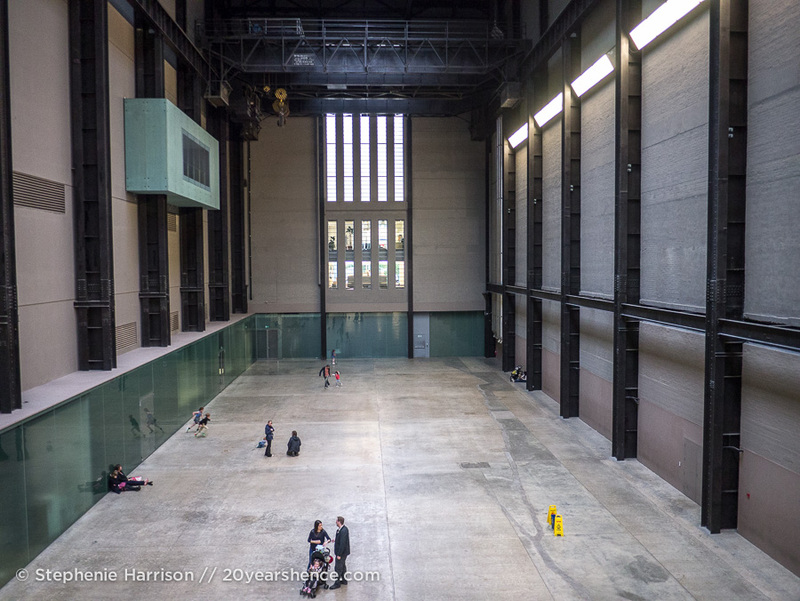 I am not surprised to hear that the Tate Modern is your favorite London museum. We are not the biggest modern art lovers, hence why we only stopped by briefly, but for fans of that style I have no doubt it’s a great treat! Sometimes the most enjoyment comes from finding free activities. You don’t worry about getting your money’s worth, you don’t worry about if you made the right decision to go, you get to just experience whatever you’re doing and focus on enjoying that. I completely understand reasonable entrance fees for upkeep and improvements, but not having to pay one can make an attraction better, in a way. And when we’re talking about a place like London, free is the greatest word in the English dictionary! Exactly. I find that I more often enjoy free activities than paid ones because I am much more forgiving and find I am not always worrying about whether I am getting my money’s worth. I have no problem paying a donation here and there, but again, it’s nice to pay what you think something is worth and not what you are told you must pay! 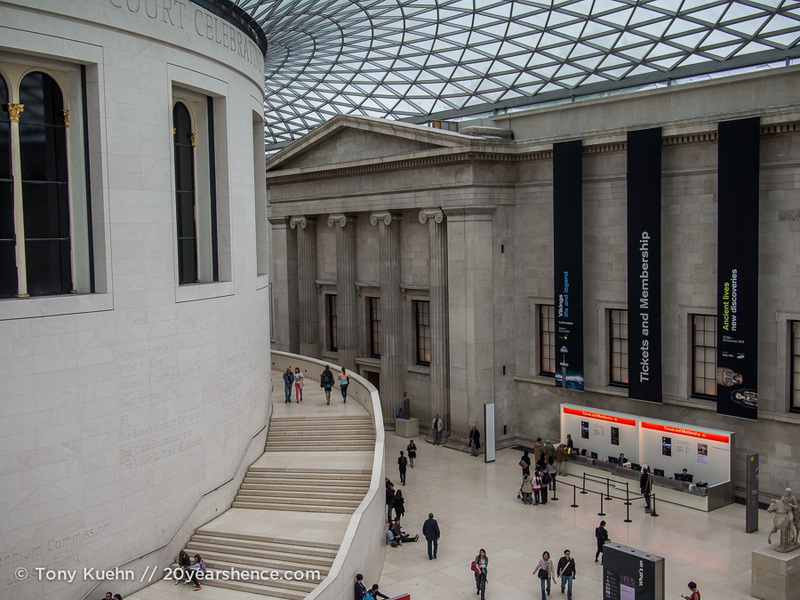 Thank you for this round up – I have been to London several times, but never realized that all of the museums are free! (I know says much about me being a good tourist, eh?) The last time I was there, I LOVED visiting the flower market on Columbia road. I came back with gorgeous peonies for my hotel room and a flower pot to plant cat grass for my cat at home. ) Also I found the prices to be quite reasonable at the market compared to the general sticker shock of say a coffee with a breakfast sandwich running over $15. Anyway, I am bookmarking your recommendations for our future visit to London town! We had friends recommend the Columbia flower market to us, but we weren’t able to squeeze it into our already packed Saturday morning. We’ll definitely make sure to check it out next time! great guide! I’m bookmarking this for my next trip to the UK! I hope it proves useful! 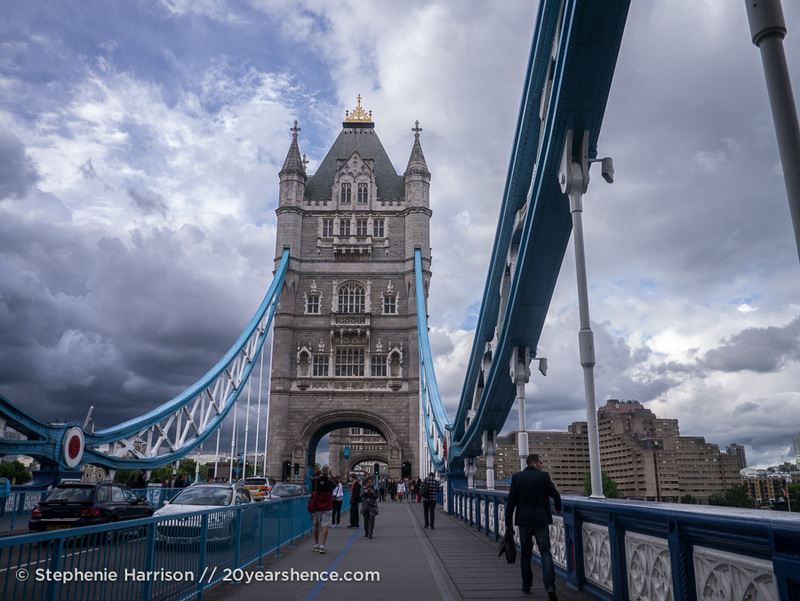 There is so much to see & do in London, it’s actually kind of crazy! I can definitely understand your dilemma, especially since lodging is not cheap in London. But it is nice that there are so many free things to see and do to help balance your budget! Great work! I know I will return to London one day and try to fall in love with it – and this guide will be my friend! Thank you!! I think one of the best things about London is that you can do so much there for free. Andrew and I were shocked to find that so many museums around the world charge admission, even in wealthy places like New Zealand and Australia; museums, like libraries, should be accessible to everyone! One of my favourite things to do in London is take a picnic to one of the amazing parks and dog walk/spot; we did a lot of that this summer while we were house/dog sitting and it was awesome and totally free. There are also many free festivals such as Notting Hill Carnival and the Thames Festival. I have been meaning to see a £5 play at the Globe for years now and still didn’t manage it this summer – next time! I agree that I really believe that museums should be made accessible to as many people as possible and it is SO nice that so many of London’s museums are free. I don’t think we would have been able to visit so many (or any!) of them if we had had to pay an entry fee. And it’s great that there are so many beautiful parks and festivals that can be enjoyed for free. I know that London is a pricey place, but once you’ve taken care of your requisite costs, there really is so much that can be enjoyed without spending anything else. We managed to stretch our time in London to 9 days which was awesome. By far the longest I have ever been in the city, but still not enough time! Despite all we managed to do, we missed out on far more. And really, skimping on admissions/activities in order to funnel that money into food is the best possible budgeting! Such a good list Steph and yes, there are loads of things to do in London for absolutely no money at all! I used to live in London and my absolute favourite thing was the river. Totally free. And all the museums and galleries. Again free. The other thing to do is to walk around. 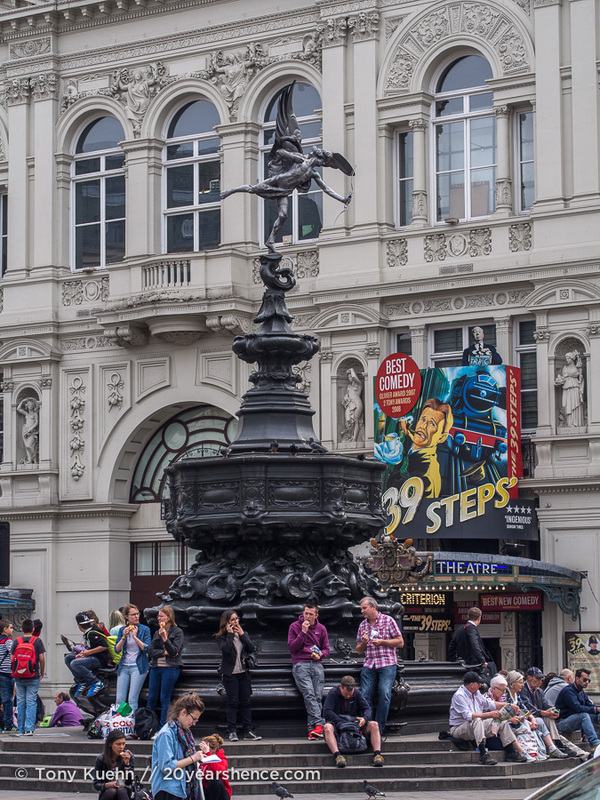 There’s just so much to see and lots of free entertainment at Leicester Square and Covent Garden! Walking tours are free and lots of newspapers and magazines can be picked up outside the train station also free of charge so that you can see what’s on. There’s always lots of competitions for the day (from the Evening Standard), and if you ring up and mention the code if it’s either free or pittance. While I was living in London, you could visit various fringe theatres on a Monday by donating whatever you had and loads of pub comedy nights were free too. If you had a student card or “looked” like a student, you could go to any of the university bars and have a pint for £1.00, sometimes less. The Prince Charles Cinema at the corner of Leicester Square had midday film matinees for £2.00. You could also apply to be a “film critic” and watch movies for free. And every now and then you could go to a top restaurant and have a two-course lunch or dinner, including a glass of wine for just £10.00. I did that myself this year. Classy or what?! Ah, London. I misssssss you! Victoria@ The British Berliner recently posted..Go to Bangkok or go to Chiang Mai. Just do it! Wow, Victoria, you definitely know how to work the system! So many great tips here that only a local would know; thanks for sharing with us! It’s true! That’s why blogs are so valuable for inside tips and how to do stuff, which you’d probably not find anywhere else as it’s so personal LOL! Victoria@ The British Berliner recently posted..We Need To Talk About The Elephants! : A Mahout Training Course at The Baanchang Elephant Park. There are some awesome tips here! I knew some of the museums were free but I didn’t know all of them were! That’s so cool. Also, whoa, check out those dark clouds!! There are so many museums in London and not all of them are free, but pretty much all the major ones are, which is SO NICE. 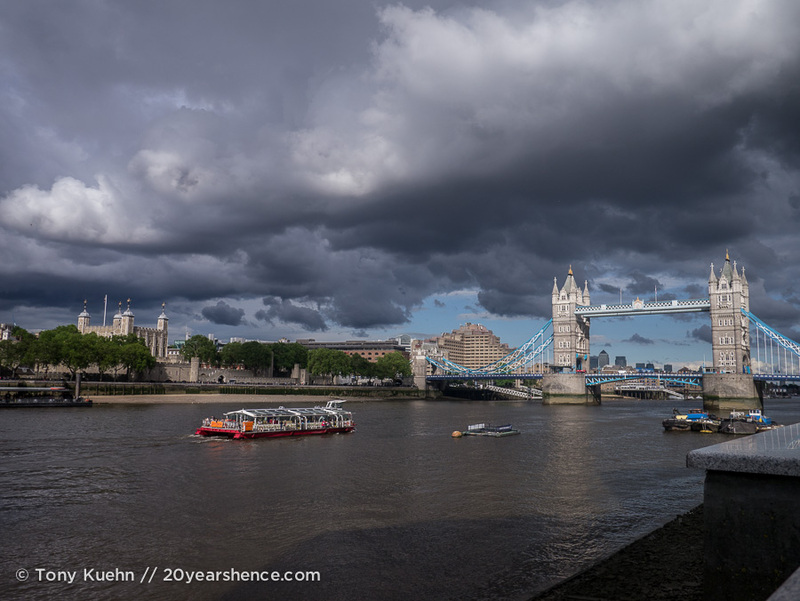 Especially when the weather doesn’t care to cooperate with you, which—as you can see from our photos—it didn’t! 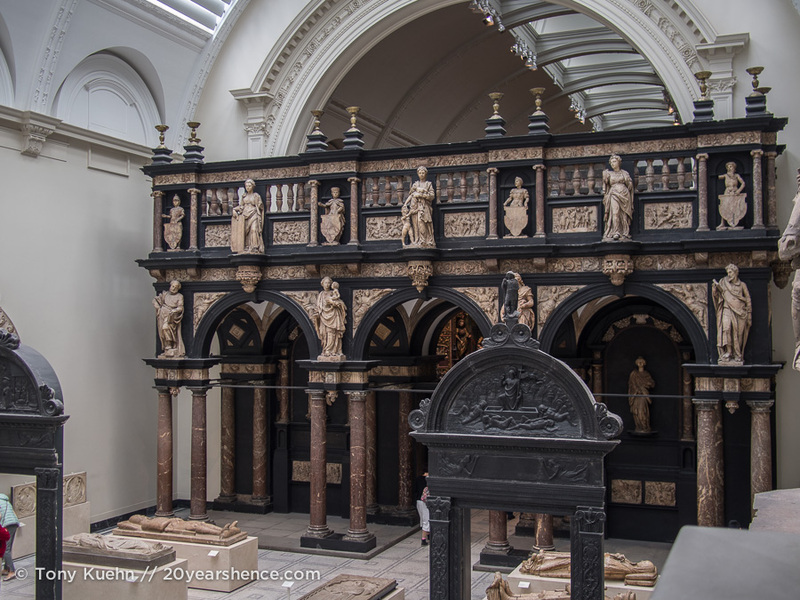 This makes me want to go to London- such exceptional museums! Yeah, I’m not even a big museum person and even I can’t resist the museums in London. What’s especially nice is they aren’t all just about art, but offer plenty of different areas to explore based on your own interests! I can’t believe that London is the most expensive city in the world now, I knew it was bad but…! Completely agree with you and do feel very lucky for the museums. The British Museum is still one of my favourite in the world, there’s something so special about the rotunda library. 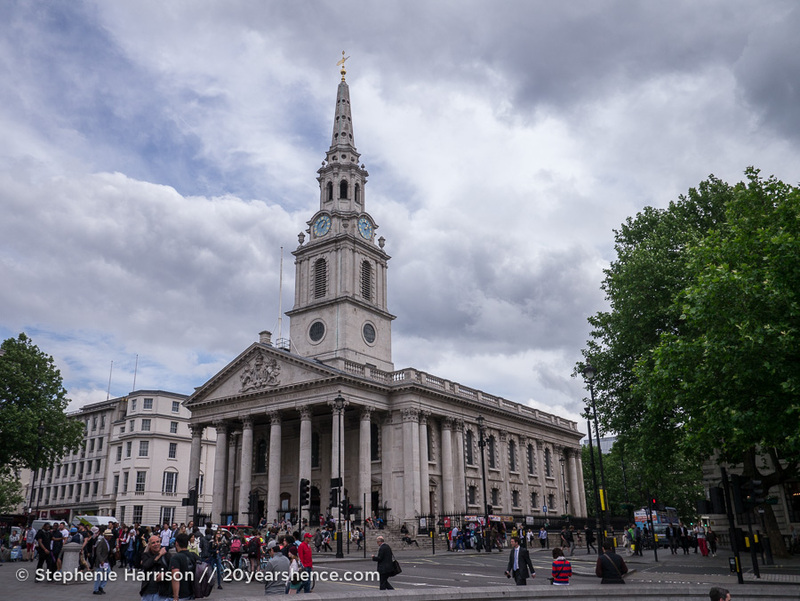 London is definitely expensive, but it is so nice that there are so many free things to do, ones that most other cities would certainly put a premium price tag on. I’m not a big museum person, but the British Museum is definitely one of the most impressive ones I’ve ever been to. My favorite free activity in London is head to and walk around football grounds. I’ve only done so at three in London – Stamford Bridge (Chelsea), Upton Park (West Ham United) and the Emirates (Arsenal). Visitors can take tours of just about any ground in London but they aren’t free. But I remember walking around the Emirates just prior to an Arsenal was just breathtaking because the red half of North London was buzzing with excitement. Well, the best part about London attractions is definitely its museums and galleries. The National Gallery and The London Museum are my favourite. 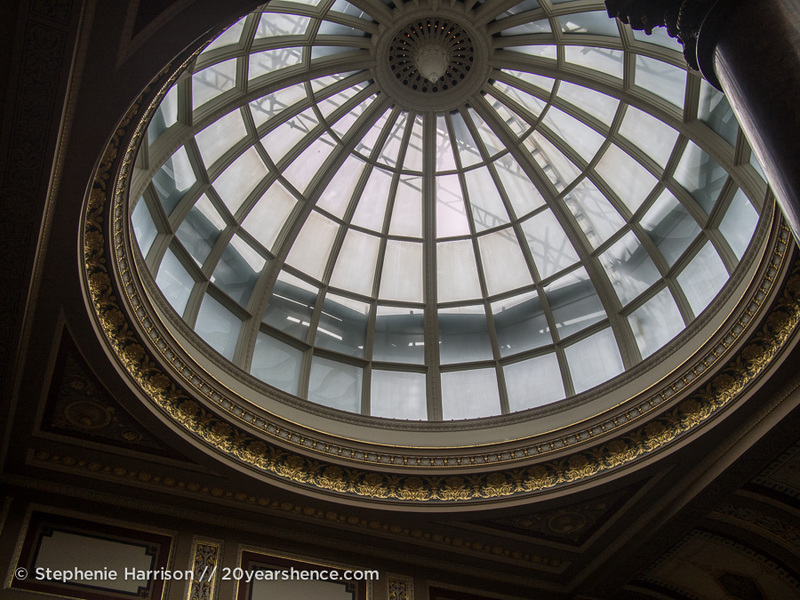 I spent two years studying next to the London Museum and have spent countless hours wandering along its expositions. Best time of my life!